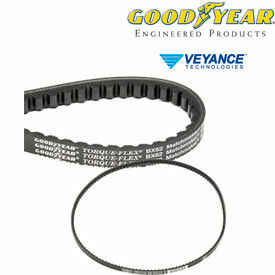 Classic V-Belts, Cogged, BX Series Are Used For Reliable Performance And Increased Service Life. Classic V-Belts, Cogged, BX Series are made of rubber for oil and heat resistance and long lasting durability. Classical cogged style for use with iron sheaves. Raw edge cogged ground form design reduces vibration and increases belt and bearing life. Torque flex belt cogged design for tough, small sheave, high-tension drives. Styles are Classical Cogged, Raw Edge Cogged and Torque Flex Belt Cogged. Color is Black. Available in a variety of belt numbers and outside lengths. Classic V-Belts, Cogged, CX Series Provide Wider Notch Spacing To Increase Rigidity And Reduce Stress On The Cord Line. Classic V-Belts, Cogged, CX Series are made of rubber for oil and heat resistance and long lasting durability. Classical cogged style for use with iron sheaves. Raw edge cogged ground form design reduces vibration and increases belt and bearing life. 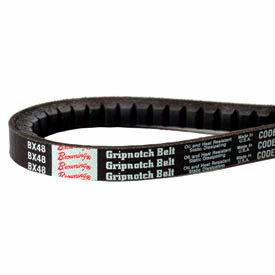 Torque flex belt cogged design for tough, small sheave, high-tension drives. Styles are Classical Cogged, Raw Edge Cogged and Torque Flex Belt Cogged. Color is Black. Available in a variety of belt numbers and outside lengths. Widths are 7/8 in. and .88 in..
Classic V-Belts, Cogged, AX Series Increases Rigidity And Stability While Reducing Stress. Classic V-Belts have a fabric top and bottom plus wider notch spacing increases rigidity and stability while reducing the stress on the cord line. Classical cogged AX Belt is 1/2 in. wide and resists oil and heat for use with iron sheaves. Raw Edge Cogged reduces vibration and increases belt and bearing life. Cover on top and bottom of belt increases stability and lowers cord stress. Cogged style has 25% - 30% higher power ratings than standard V-belts. Heat, ozone, and abrasion resistant. Lengths vary per model.